Larry Correia's high fantasy novel Son of the Black Sword is set in Lok, a mythical alternate world based on India and Southeast Asia. That world is one of the many features that go against the fantasy grain and set Larry Correia's epic apart. Despite that feature one classic theme of the genre, the magic sword, made the cut. This sword is Angruvadal, one of the Ancestor Blades of Lok that, like Excalibur, choose their bearer and endow the bearer with great skills. Setting magic aside however, Angruvadal stands in sharp contrast to the world it lives in. "Unlike most swords in Lok, Angruvadal was straight, not curved in any way. arm. The grip was long enough for two-hand use." From that brief description from Correia's Son of the Black Sword we get straight, double-edged, really sharp, and with a long two-handed handle. Let's start with that first quality, straight. Double-edged Ulfberht sword. Image from Hank Reinhardt's The Book of Swords, Hank Reinhardt, Baen 2009. It is a common belief that the curved blade out-cuts the straight. It is such a common belief that the principle argument of saber design is straight versus curved, your opinion resting on whether the cut or the thrust is more important. That particular query was answered nicely by Samuel Colt in 1847, but they were still arguing about it when the Germans answered it with machine guns in WWI. Even then, Patton annoyed Pershing with it in later years. Like most assumptions in this field the truth is more complicated than binary options. The right answer is: sometimes. Curved blades perform better with certain types of cuts through soft material. They are likewise lacking in other areas. Before we get into the trouble with the curve though, let's take a look at the positives. It is a common belief that curved swords are superior because they make contact with less surface area. That idea is an extension of the wedge concept, the mechanical rule by which all blades work, mass and force focused on a tiny point. The curve can work this way as well provided that you are cutting into a flat surface. Real world things however, people for example—tend to be curvy and create their own small surface area at the point of contact with any blade. The first thing we really gain with curvature is sheer. Sheer is cutting force developed by an edge pulled across a surface. It works the same way as a steak knife or saw. All edges on a microscopic level have teeth, and just like serrations they bite and tear whatever they are drug across. With a straight sword this is achieved by the draw cut or push cut. Both techniques create sheer, but both have the disadvantage of adding complication to the cutting stroke and diminishing force by redirection. In other words, a chop is a simple movement with all of the energy traveling straight into the target. The draw or push cut moves in two directions, one of them indirect to the target. Additionally, both are hard to perform from horseback. The curved sword by contrast can simply be swung through in a straightforward manner, its curvature providing the draw and the sheer. Sword blade with temper line. Image from Hank Reinhardt's The Book of Swords, Hank Reinhardt, Baen 2009. The second thing we gain is edge geometry. That's a fancy term for the acuteness of angle that makes an edge. For obvious reasons a thin wedge cuts better than a thick one, but you quickly get into diminishing returns here. The loss of mass becomes less potential energy, and the thinner blade is a weaker one. An alternative is to make the wedge longer (blade wider) so the transition to thickness is more gradual. This works well, but requires the carrying of a wide, cumbersome sword. Enter again our friend the draw cut. By pulling the blade through the cut we force the material to cross the blade diagonally, in effect creating a wider blade with less dramatic pitch. Or, again, we can just hit them with a curve. An abrupt edge (top) and an appleseed or rolled edge (bottom). Image from Hank Reinhardt's The Book of Swords, Hank Reinhardt, Baen 2009. One simple but ignored effect of curvature is mass. All other things being equal, a curved blade is heavier than the same length straight. For most of history that didn't matter. One made a sword as light or heavy as needed within the limits of technology and material. In later years when the sword is a distant second or third to firearms, it mattered because a shorter blade was easier to carry. Of course, this means the straight blade will be faster, but it remains that the curved should cut better. Hank Reinhardt cutting mail armor on a pig shoulder. So with all that in mind, why does most of history give us straight swords? There is a popular myth that curved swords require more advanced technology. Considering the enormous energy man has spent trying to make his world straight, I find this almost as funny as the idea that the no edge sword (rapier) is an advance. Curving a blade is easy, it's what it wants to do when you hammer out an edge. As you flatten the edge you are expanding its lateral dimension. In a perfect world all of that expansion would go straight outward from the spine. In imperfect reality it is more of a pancake effect and you end up with the edge longer than the spine. Thus the blade must curve. This is in fact the simplest explanation for the world's preference for double edges. The easiest way to keep things straight is to hammer out the other side. Reproduction falcata. Image from Hank Reinhardt's The Book of Swords, Hank Reinhardt, Baen 2009. The best answer as to why we have straight edges is armor. To understand this we need to look at a different type of curved blade, the kind carried by Ashok's childhood friend and brother in arms, Devedas. Devedas comes from southern mountain dwellers so it is rather fitting that his sword resembles a knife of the Himalayas. It is described by Ashok as curving forward with the edge on the inside, just like the kukri of Nepal. This forward curvature gives all the advantages of sheer and edge geometry and one other I haven't mentioned yet. To see this one in action place a kukri edge up on a table and slide the tip under a book. Now push down on the handle. Voila, the kukri is a lever. That leverage translates into great cutting force, penetrating mail with ease. Just as the forward curve gives us leverage, backward takes it away. Thus, wherever there is good armor, swords are either straight or bend forward. But straight swords are the usual answer—which seems counter intuitive to our lever demonstration. This is because when dealing with armor the thrust does indeed beat the cut. It isn't that the thrust is more effective a penetrator, it's that it is required to penetrate less. Let’s take a look at the downward cut to the shoulder, perhaps the most effective cut against mail. This cut generates a great deal of force because it has gravity on its side and the point of impact corresponds with a relatively strong range of our shoulder rotation. Additionally the shoulder is where the weight of the hauberk is suspended, and the links are at their maximum stress. Those factors make splitting the mail here an easy task. Unfortunately, that is not enough. Splitting the links gets you a surface cut, or even less if the gambeson is thick and strong. To continue cutting deeper into the clavicle and subclavian arteries it is necessary to continue the cut through the links on the front and back of the shoulder. As armor improved this became increasingly difficult even for an axe. With a thrust once the width of the tip has penetrated it can plunge through with only the flesh to resist it. ". . . It was double edged"
Normans. Image courtesy of Allen Williams. Nearly all sword cultures have at one point been dominated by double-edged swords and at another point by single-edged. Why? There are the simple answers. Keeping the sword straight, as I said above. Having a second edge to use when one gets dull is another. Then there's that reason that Larry surprised me with, that when you take the sword to hand you do not have to worry about where the edge is. That last is my favorite, for it falls into the realm of tactics. I am interested in swordsmen first and swords second so that is the realm we will look at. The utility of the back edge is small in comparison to the front which has historically led to terms like "weak edge" or "false edge." There are far less cuts available to it, and the cuts are weak by comparison. Taking that into account, what is available to the week edge adds a world of strategy to the sword fight. To demonstrate let's take a look into a paradoxical source, The Book of Five Rings by Miyamato Musashi, the most widely read Japanese sword manual. Musashi advises us to follow up our cuts by cutting back on the same line. So we see that the first two of Musashi's techniques begin with a cut downward followed by turning the blade and cutting upward. This is to catch the hands in the counterattack. When you try this, you will likely find as I do that the grip and wrist position are awkward and the cut, by consequence, rather weak. There is also time lost at the bottom in the act of turning the edge upward. Granted this is less than a second of loss, but that is the kind of time lapse that fights are won and lost on. With a back edge it is a simple act of pulling the sword straight back and up in rapid fashion. It is quick, natural, and strong. It also facilitates a retreat as you back away from the counter cut. Something else at play here is the "tell." That is tell in the poker sense, as in inadvertently indicating your intent. It is more commonly known in martial circles as "telegraph," but I prefer "tell" because it is more descriptive. Most of our tells come from our upper body simply because it is high in the enemy's line of sight. And assuming you're not looking before you cut, which would make you an easy mark, the biggest indicator is your shoulders. All hand movement starts at the shoulder and as you turn that edge upward the rolling of your shoulder tells all. And your target doesn't even have to be aware of it. It is a perfectly natural reaction to back away from motion in the shoulders. I personally reacted to it for years before I became aware of it. This kind of thing also works with horizontal cuts. Take the common right to left cut, typically performed with the lead edge and the hand supinated, palm skyward. This is the fastest and strongest cut to your enemy's left side, but it is a large movement that can be easily detected and avoided. The tell of the shoulder roll is more exaggerated because the arm is extended. There is also a noticeable effect on balance. To see how this works stand with your feet together and stick your arm out to the side. Now rotate your shoulder until your palm is up. You should feel your balance shifting back and out, with more of your weight on that foot. Now try it on one leg or with your eyes closed. This is a subtle thing, and may seem trivial, but when you add the mass of the sword and the speed of fight it becomes magnified. The end effect is that your weight shifts heavily onto that outside foot, which momentarily immobilizes you. This is not to say that it is an ineffective cut, but it has natural weaknesses that can be exploited, or mitigated, through use of the back edge. Enter the hook. I use the term "hook" from boxing as it is the most analogous technique. It's a short circular motion with the palm downward and the back edge leading. Unlike the boxing hook it is not particularly powerful, but it is sneaky. It slips in with nary a tell to slice the neck, eye or hand. The keys are first in that palm downward description, which eliminates the tell and balance shift. Second is the short circular motion which is subtle, harder to detect, and comes in at a different arc and angle than your opponent anticipates. It is particularly handy against a shield, slipping through the blind spot that the shield provides and under the lower shield edge to the thigh, or over the upper to the face. Another tactic is to flip the sword in mid cut. Start with a traditional cut at the hip or midsection. As the shield drops to intervene, flip your blade. This flipping motion will direct your cut upward sending your back edge over the top of the shield and into the head. You may have to follow up by flipping the sword again and cutting downward, but the important thing is passing the shield. The reverse of this is to use the back edge for a high cut at the head. As the shield rises, flip the sword and cut under the shield, or impact the shield and then rake the front edge down to the leg. But the back edge isn't just for cutting. In fact, it may be more important in the thrust. Thrusts, while efficient, are low on the trauma production scale. Therefore, it is common practice to finish a thrust by cutting one's way out of the victim. Two edges make this easier, and it is in fact the back edge that is better for this cut because it is natural to pull upward as you pull the sword free. But what is vastly more important than the thrust you land is the one you miss. A common defensive tactic is to slip the thrust, that is to step inside or outside of the point. This both saves your opponent from your thrust and positions them in range to counter thrust. The best response to this is to cut into their new position. Two edges simply provide more coverage. So with all that, why does the single-edge sword come to dominance? In a word, simplicity. The paradox of that is that the single-edge usually follows the double. Even in Japan the earliest swords are double-edge Chinese type swords. Why? What I have observed is that two edges dominate in cultures that are actively involved in close melee warfare. The single edge dominates cultures once they have moved into primarily missile-based warfare. We can see this in the sabers of the Mideast which show up with the dominance of archery. We can see it in Japan, for what are samurai first? Not swordsmen but archers. In fact, all of the katana manuals come after the battle of Sekigahara, in a time of peace and relative order. But no better example exists for me than the Bowie knife. Antebellum Bowies are big. If we consider a gladius a sword then we certainly must consider the early Bowie a sword, too. Antebellum Bowies are also distinct from their post-Civil-War progeny by the sharpened back edge. The shifting point is the Civil War, and the reasons are Samuel Colt and Christopher Spencer. Before that, before reliable repeating firearms, we had to follow the words of Colonel Rodgers to his Rangers and close with enemy with sword and hatchet (and big sharp double-edged knives)! Katana. Image courtesy of Allen Williams. So when the sword is a distant second or third weapon it is easier to make it single-edged. It is one edge to grind. It simplifies heat treating. It simplifies scabbard making, sword sharpening, and even training. And we can pretty well guess that simplicity was a major factor by the fact that it is curved, because again that's just what single-edge swords want to do. A fortunate side effect of simplicity is that it is also easier to make the sword better in many ways. Particularly the heat-treating aspect can be better. The trick of heat treating is that you want a very hard edge and a softer, springier spine. This requires heating and cooling the two at different rates. This is easier when you can isolate one complete half of the blade from the other. You can also get better edge geometry with a single edge as you can taper the edge completely from one side. Better geometry and harder edges make for a great cutting tool, which brings us to a great paradox. Why was Europe, the most armored culture in history, dominated by double edge swords? We'll return to that mystery in a bit, as it ties into yet another factor. It is a common belief that the single edge sword is lighter. That seems logical considering that it is really half of double-edged sword. I have come in contact twice with actual "half swords." These started life as double-edge swords and were irreparably damaged on one side. The inventive owners cut off the offending edge just a little shy of the spine and created the lightest fastest sabers I have ever seen. But this of course is not the way sabers are made. The time and material waste would be prohibitive. The truth is most single-edged swords are as heavy or heavier than comparable doubles. The katana, for example, weighs in at about two and a half pounds, which is typical of European swords as well. What's important to note here is that though the weights are similar the size is not. European blades are typically over 30 inches, while katanas are typically 28-30. So if we are going to compare apples to apples, or in this case short swords to short swords, I give you the sword of Henry V. Twenty-seven inches of double-edged blade, sitting on a wide guard and hand-and-a-half handle, and weighing just over two pounds. Henry V sword. Image from Hank Reinhardt's The Book of Swords, Hank Reinhardt, Baen 2009. So how is that possible? How were the double edge weapons larger and yet as light or lighter? Well they seem larger when viewed on the flat. If you turn them and look edge-on you will see that they are thinner in both edge and spine. I think three factors are at work here. First, a certain amount of strength simply comes down to mass, and there seems to be at various levels of technology a certain minimum mass that a sword's needs for strength. Second, there seems to be a minimum mass for a sword to cut well and generally function as a fighting tool. The light sword for example is quicker, but easier to turn aside. Double-edge weapons spread their mass over a wide, flat blade, while single edges keep it in thickness. That brings us back to the paradox of double edges and armor. It would seem that the stronger potential of the single edge would be a more logical choice, just as the stronger, rounded edge would also seem more suitable. Both are true when we get into the plate armor of the late middle ages and Renaissance. So much so that we switched to the very rounded single "edge" of the mace and hammer. 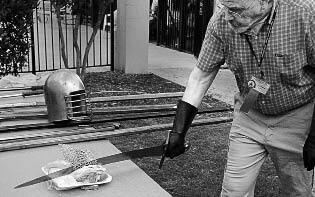 It was Hank Reinhardt's theory that this era is the death knell of the sword. But for more than a millennium prior to that armor was of a weaker construction, consisting of the metal rings of mail and coats of small plates typically attached to cloth. Both of these part better for the sharper thinner edge. But it still stands to reason that the longer and potentially better edge geometry of the single edge would prevail. My theory is that this comes down to friction. Once the edge passes then the rest of the blade must follow, and all of that blade produces friction through both width and thickness. I believe that the double-edged sword mitigates this through both thinness and by the friction falling off at the midpoint as the back edge follows in the vacuum of the spine. So, double edges for the win? Personally, I'm a katana man first. Nothing feels more natural in my hands, and I've spent more time with it than any other weapon. I say this so you won't think this has been either a Western bias or Tolkien fetish. There are advantages to single edges. I fully believe that with the same technology and same attention to detail the single edge sword should be lighter, stronger and sharper. It's just that we rarely see it so. I have seen a few good ones. Among the best is in a friend's collection of talwars. The entire collection is exceptional, but this one in particular is light, fast and extremely well-tempered. It will bend ninety degrees and return to true, and it will take a file across its edge without scratching. Unfortunately, it is still a talwar and cursed with possibly the worst handle ever put on a sword. ". . . sharp enough on either side to effortlessly lop off a man's arm." Is this accurate? If we are to believe Sigmund Ringneck and much of the HEMA community the answer is no. If we are to believe the Sagas, and with that Oakeshott and Reinhardt, then the answer is certainly yes. But let's look at the evidence. We know for a fact that it is possible to sharpen a sword beyond shaving sharp, and that it is possible to remove a limb with a sword that is relatively dull. It is indeed a truth that swords generate enough force that they need not be very sharp to do great damage. And thus we see YouTube videos in which people demonstrate cutting with a dull blade. This is a product of both parlor trick and misunderstanding. First, there is the object being cut, which is usually a tatami mat. These are not hard to cut. They are in fact a popular cutting medium because they are easy to cut. So easy in fact that you can cut them with a dull sword. You can also do a pretty good number on them with a stick. Now, cutting naked flesh is also not that difficult, but, contrary to Frank Frazetta's wonderful artwork, most people do not go to war in naked flesh, or even mats of straw. They prefer to be clad in clothing, thick clothing in fact, and often clothing made of tiny metal rings. At the very least they have bones. All of this responds better to a sharp edge. The misunderstanding part comes with that "force generated" part. If you watch these guys, you see they're using big sweeping cuts with a lot of power. In fighting we call these "misses," or on the receiving end we call them "opportunities." Big cuts are the equivalent of winding up a punch. The tell is actually in the cut itself. You should probably go full Hollywood with this and scream like a barbarian, so they'll really know you're serious. In reality, smaller contained strikes work while the big stuff usually fails. The big moves are usually just to sucker your opponent into missing the little jab that that slips in. We know from historical and archaeological sources that swords were indeed very sharp. The Norse sagas tell us of limbs being removed without much effort. The graves at Visby in Sweden give us a skull that has been cleft cleanly in half, and a skeleton with both femurs severed by what appears by angle to be a single cut. Both of these examples require a very sharp weapon. The Japanese have manuals for the various techniques of cutting a man in half, the most impressive being the cut from shoulder through opposing hip. But this was known in Europe as well. Richard Burton wrote that he wanted to know if it was possible to cut a man this way with a single hand sword, indicating that he knew it was possible with two hands. He came close to it once when he cut an enemy down just so. As his blade was finishing the cut and passing through the hip his horse bucked and interrupted the cut. So he failed, but his opponent did not seem to have noticed. We also have quite a bit of evidence to the contrary. To begin with, most of the surviving examples of swords we have aren't particularly sharp. This would seem to be definitive, but we must take in the context of surviving. Oakeshott points out in the Archaeology of Weapons that we see a lot of war hammers in illustrations, but don't have many examples. We do have a hell of a lot of maces. His explanation was that a hammer continues to get used even after the war is over, so they don't survive. I believe most of our surviving swords survived because they weren't used. Not being used they wouldn't need to be sharp. But we cannot ignore the German fechtbuch fight manuals that have become so popular over the last few decades. These manuals are full of half-swording, and blade grabbing, and edge-to-edge blocking, all of which indicate dull weapons. We also have the murder stroke a la Hans Talhoffer, in which you grab the blade with both hands and strike with the pommel. I mention this last because it is the best example of why I dismiss much of the fechtbuchs. Even if we assume the sword is dull—and quite dull it would have to be, this technique is ludicrous and dysfunctional. In addition to the complete tactical disadvantage of the maneuver, it is mechanically ineffective. First, you are using a flat flexible piece of steel as your handle. It is not a good one. Second, you are striking with the tang, generally the most fragile part of a sword. Finally, a sword is designed to exert great force at the distal third of the blade, and it converts this force to great penetrative power through the wedge effect. You are trading that for a short strike using a flexible handle and a blunt and fragile striking surface. But having said that, I don't assume it is pure fiction. Talhoffer was recording duels he had observed. Duels are strange things. They are not really fights; they're more like deadly adventure sports. Duels often include both silly rules and weapons that would never apply in war or street fighting. Thus, for example we have the rapier, master of the duel and just about useless for anything else. In Talhoffer's book we see many examples of the strangeness of dueling. We have a man fighting a woman while he is waist deep in a hole. We have people fighting with strange shields with points on the ends. And then we have the murder stroke, which fits right in with the other two. I am convinced this is a duel with sword effigies either made of wood or cast in cheap metal as a single piece, handle and all. The clue with the fechtbuchs is the time line. The bulk of them show up in the 15th century or later. To put this in perspective, we have cannon in the early 14th, and handguns by 1400, so we are clearly in the missile culture I spoke of earlier. One of the side effects of that is the advent of full plate armor. This begins shortly after the battle of Crecy in which the English longbow made short work of French mail. It only got worse with gunpowder. Swords are fairly useless against plate armor, and yet they were still carried. It is arguable that they became thick and dull in an attempt to use them on plate, or just so that they would survive the occasional contact with it. But the timeline leads me to another theory entirely. Before Crecy was Sterling Bridge. Sterling Bridge is that battle you saw portrayed in Braveheart where pike warfare was more or less invented. Two decades later at the battle of Coutrai a group of peasants armed with a type of poleax called a goendac destroyed a company of knights. Then, there's Crecy. Then, there's the rise of the Swiss pikeman. Warfare as it had been known was rapidly changing. One of the interesting side effects of this change is the shield, or more specifically its absence. It didn't just disappear of course, but it gradually faded from the forefront of battle for logical reasons. All of these weapons we have described here, the pike, the poleax, the bow and the gun, require two hands to operate. There's no hand to hold the shield. You could still carry a shield, and some did, usually in the form of a buckler, but this would be for use with your secondary weapon, the sword, and would likely interfere with your primary purpose. So without shields what do you get? You get all the edge on edge contact that we see in the manuals. This destroys sharp edges. So the way I see it, in the heyday of the sword it was very sharp. As it became less useful for a variety of reasons it became dull. As it became dull it became less useful. As it became less useful the emphasis was placed on dueling. As the emphasis was placed on dueling it became even less useful. Eventually the people who were still fighting threw it away and started carrying guns and Bowie knives. ". . . The grip was long enough for two-hand use . . ."
It is a common myth that the strength of the two-hand sword is in its large sweeping cuts. There is some utility in this but mostly we call those misses. They are even "missier" than the regular misses because using two hands requires more shoulder involvement and thus more tells. The strength is in the opposite, in the small, fast motions. The secret here is control. One of the reasons for the popularity of the two-hand weapon in modern times is that it is easier to learn how to manipulate a sword with two hands than with one. The signature technique, the one that makes all this control possible, is what I call the lever cut. This is simply using the upper and lower hands against each other to lever the blade around. This is accomplished with a single hand grip by the upper and lower portions of the hand, which is why single hand handles are more complex with pommels and guards that give the hand purchase. But the same is much easier with two hands. The best example of this is the cut to the hands from Chudan or middle position. The sword is held straight out in front with a slight elevation of the tip. To cut you simply push the upper hand forward and leave the lower hand fixed. The power generated is quite surprising. For more power lift up with the lower hand. This continues to work even as we move into the larger cuts. Don't use a big arcing motion—that is easy to see and avoid. First, you move your hands towards the target and then you lever the blade around. More important than the power this generates is the speed and control. Control equals accuracy, and control eliminates the fatal error of over commitment. But there is power. Initial speed is generated by the hands moving forward. Exponential speed and power are generated by that sword whipping around the moving fulcrum of your hands. As you cut through, the blade is less likely to twist off line because you have two opposing grips to keep it straight. Finally, you can get a bit of your weight behind the blade for a really hard cut. There is also more control in blade on blade contact. That contact is more likely with two-hand weapons because you end up essentially fighting for the center. For obvious reasons the two-hand weapon can push the single aside with relative ease. Despite all of this, Musashi, Japan's most celebrated swordsman, used his katana in one hand, and he was quite good at it. To be fair he was quite good before he started that. There has been endless speculation as to how and why he did this, but the more interesting question is why it wasn't common practice already, because it certainly was the norm in most of the world. With all the advantages of two hands you may wonder why this is so. And the strange answer is that indeed two hands are better than one. It's just that two hands working independently are much better than two acting as one. We see that clearly in that Musashi used a wakizashi in his left hand. Most of the world has done the same throughout sword history. It was done both with daggers and short swords in the left hand, but most commonly with a shield there. Using two weapons you are trading speed and control for greater options. You have more attacks available and more defenses. You have the exponential effect of both as you tie up your opponent's sword with one weapon and attack with the other. This can be done from either side. You can block his sword with your shield while you cut him down with your free hand, or you can tie up his sword with your own and strike him with the edge of your shield. There are ways to win this fight from the other side, but it is difficult. But what about the power we talked about earlier? Strangely enough, I have found one hand strikes to be more effective for cutting armor than two. I attribute it to the greater range of motion I can achieve with one arm, and thus more velocity in the strike. Here again though we get into a strike that is easy to miss with, and even easier to over commit with. Interestingly enough, in the original game of Lacrosse as played by the Iroquois it was legal to strike with the crosse, but only if you used two hands. Returning to the question of why Musashi's technique was not already common in Japan, it is my theory that it had been at one time. I say this in part because Musashi mentions shields in the beginning of his book where he argues for the sword in one hand, but mostly because of the fact that the katana, or in its earlier form the tachi, was designed to be used on horseback, which doesn't lend itself well to a two-hand grip. So why the long handle? Because it lacks a pommel. One of the main functions of a pommel is to counterbalance the blade. 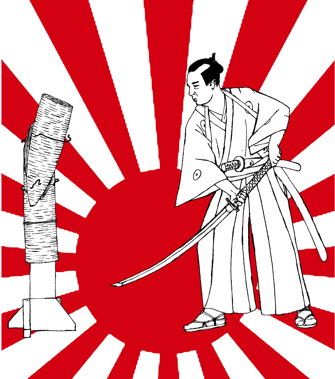 Long handles on Katanas act as a counterbalance. I don't think it is an accident that the longest handles tend to show up on the earlier swords from the warring periods. So if you we get more control with the two-hand handle, the next logical step is to make the sword longer. Weapons first and foremost give man distance, and weapon design follows that trend. Angruvadal's "thirty-six inches of black steel" is a good example but falls far short of the forty plus inch blades that adorned the great swords of Europe. Having said that, three feet, in my opinion, is the upper end of usefulness in a sword blade. I am not the first to question the utility of great swords. Hank Reinhardt did so before me, and Oakeshott remarked that they were not particularly useful. The ironic reason for my opinion is distance. For when man reaches for "reach," he does not grab a sword, he instead picks up a spear. According to archaeologist Richard Leakey, the first spear shows up around fifty thousand years ago. I think that's a gross underestimation, but good enough for our purposes. Since then the history of warfare is mostly the history of the spear. From the flint tips of the Cro-Magnons, through the lances of chivalry, to the pikes of the Swiss Reislauffer, the spear is only occasionally interrupted by various missiles. There we would be busily killing each other with spears when someone would invent a new variation of missile (better javelin, bow, sling, or tip) and change things for a bit, usually with great carnage as people adjusted. Shortly thereafter everyone would adjust, with better armor shields, etc., and get back to killing each other with spears. Best example of this was probably the Battle of Crecy, but it went that way until somebody invented that really cool bow known as a gun. Even then guns were used alongside spears until the invention of the bayonet made them one. So, why the hell then did we ever get into swords? Two reasons. First a spear is a bit of a burden if you are not actively using it. It's perfectly portable when you are hunting or headed for war, but inconvenient for the rest of life. The sword on the other hand isn't carried, it is worn. The sword is functionally the medieval pistol, out of the way on your side but always close at hand. If you're a Viking it also serves the same in warfare, on your side waiting to take over when you've lost or thrown your spear. This becomes difficult with a long blade. Up to about thirty-four inches wearing a sword is pretty comfortable depending on your size. Thirty-six to thirty-eight is cumbersome but manageable and requires constant attention to where the end of your sword is. In fact, Queen Elizabeth established a law that swords carried in the city of London could not have a blade greater than a yard just to deal with the clamor this caused. Past that you're getting into the ludicrous. An exception was the claymore which is the only sword historically carried on the back. But don't think Ninja style with this—the scabbard was worn like a pack and removed before drawing. That brings us to another major limitation: presentation. Like a pistol, or any other personal weapon, the sword needs to come to action in a hurry. From experience I can tell you that a thirty-six-inch rapier is a much slower draw than a katana. And thirty-eight is substantially slower than thirty-six. But there is another reason for swords. Occasionally they too interrupt the dominance of spears. This was of course most famously accomplished by the Roman Empire. The Roman Legion did not abandon the spear—they had it in the form of the pilum and the pilium. They simply ran into the same problem everybody else had, the stalemate of opposing spear formations. They solved it by closing with the shield and Gladius. The important part of that equation is the shield. The shield protects the swordsman from the spear and is the device that pushes the spear to the side for closing. As important, the shield is the best defense against arrows and other missiles. There is a very strong argument that without the shield the sword has no place on a battlefield. It is a close equivalent to a naked charge against machine guns. Using a long sword in one hand is difficult. It is even more difficult with a shield. And the long handle does not help. As mentioned above the short handle allows you to lever the top and bottom of the hand off the guard and pommel. The long handle lacks this feature as well as placing the balance of the pommel and blade at a longer axis. This axis tends to continue with its inertia and roll out of your grip. You can of course use the sword like a short one-handed spear, but then why not just use a spear? History, however, is repetitive, and in the fifteenth century we see again the stalemate of spear formations in the form of pike warfare. There were many attempted solutions. One of them quite similar to the Roman was the bucklers, who were named for the small shields used to roll underneath the pikes and close with the enemy. 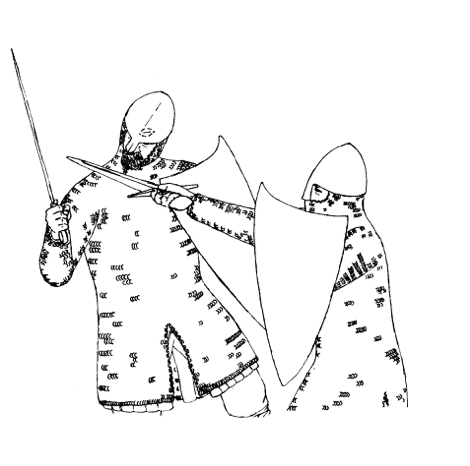 Another was variations on the poleaxe to hook and push the pikes aside. This period also corresponds with the rise of the big two handers of Europe such as the claymore, flamberge, and zwiehander. It was Hank Reinhardt's theory that these big weapons were used in the formations to push or break the pikes and close on the enemy. Inside the tip of your pike a big sword would be a scary thing to face indeed. We can see some evidence supporting this theory in the German word Doppelsöldner. It literally means "double pay soldier" and was applied to the Landsknechte who carried two-handed swords. This indicates that it had an important role. One thing we can assume with certainty is that the big swords were popular for dueling. I say this because they are a heavy feature of the 15th and 16th century fight manuals which are mostly dueling manuals. Now dueling is always a questionable source for fighting suggestions because dueling is pretty silly. It is different from a fight if for no other reason than because you know ahead of time that you're in one. As mentioned above the weapons are a common silliness, at best they are arranged to be equal. But there is a similar, less silly phenomenon in the form of individual combat. The most common form of this is of course being stabbed in the back before you know what's happening. But there is the instance of two people facing each other and squaring off without formal arrangement. In this we can see some definite efficacy in the big swords against their most natural rival, the sword with shield. “The basic strategy of sword and shield is to put your sword where his shield isn't," says Hank Reinhardt in his The Book of Swords. So where isn't the shield? It varies but there are three places that it has a hard time being. The first is the legs. There were big shields, like the kite, that were designed to protect the legs, but the typical shield held at the side covers only the knee to the shoulder. This is a choice of active defense over passive, historically the better answer in most fields. That the leg attack tends to be the easier of the two is because you can easily see a sword coming for your head. The leg shot is below the line of sight, facilitated by the shield being a blind spot to its bearer. The problem with a leg cut, however, is that you have to reach for it. Thus stooping or crouching to reach the leg is an enormous tell and makes you vulnerable by lowering your guard as well as bringing your head down where it is easier to hit. With the long sword you don't have to stoop. You also have the greater speed and change of direction provided by two hands. It is best to start by striking high so that the shield is raised in response. Then, using the lever cut described previously, change directions and bring the blade around the outside of the shield and down into the lower leg. The reverse technique gets the head. Feint low to get the shield down, then come up over the shield and strike down to the head or shoulders. The third option is the shield bearer's right (i.e., his sword hand) where the shield has a hard time reaching. With a one-handed sword you either push that space open with your shield or use a backhand cut to get inside his. Both methods put you in jeopardy by the close contact, and by placing your sword hand into the center where it is vulnerable to both blade and shield edge. With the two-hander you strike at the shield side, bounce off, and bring it rapidly around to cut at the sword arm. Alternately, you can pull your sword back, sliding off the shield, and thrust up the middle using your greater reach to keep your distance. Okay, now let's shake this up a bit. In walks a third opponent armed with a spear. He has clear advantages, but who has the best defense? The sword and shield man may seem the most vulnerable, but remember that the shield was designed for this kind of fight. The shield can push the spear point aside, clearing the way to close in and strike with the sword. You might think the same can be achieved with the big sword, but it is a difficult task. The shield can move a spear because it is short, rigid and heavy. A sword blade by contrast is long, light and flexible. Generally speaking the heavier will move the lighter, and the flexible will bend to the rigid. Additionally, a sword is essentially a reverse lever. I say reverse because the load arm (the blade) is longer than the force arm (the handle), and the longer the blade the weaker the leverage you can muster. Now the spear is even longer, but it is mostly handle, so it has tremendous leverage. Into this scenario walks a peasant armed with a quarterstaff. The staff is, of course, a short blunt spear, so our peasant likely loses that battle. He has much of the same tactics available against the shield as both the long sword and the spear, but if the shield guy knows his stuff, he should still win the day. But what about our longswordman? The peasant has more reach, more leverage, and more speed. He also has the stronger weapon. Despite what Hollywood teaches, cutting through hard wood with a sword is very difficult. And if you think you can't break a sword with a stick you're in for a very nasty surprise. But in the words of Hank Reinhardt, "there is no best sword." The best depends entirely on what you are doing with it, and Angruvadal has very special purpose: the killing of demons. The demons of Larry Correia's Lok are large monsters with nigh-impenetrable hides that come out of the depths of the ocean. If we look around our world for an equivalent, we see it best in Africa. And our monster hunters there, dealing with large beasts with thick hides, swear by penetration. With thirty-six inches of straight double-edged blade, sharp enough to penetrate demon hide, and the strength of two hands powering it, Angruvadal seems to be the perfect sword for the task. Whit Williams is a writer, a medic, and a protégé of the great Hank Reinhardt. His published work includes the short story "Lion Country" and the interim chapters of Hank Reinhardt's Book of Knives. Currently he is working on a new book, The Reinhardt Method of Rapier & Dagger, the first in a series of books about sword technique.